The one thing first-time parents are often warned about is that their new born will cause sleepless nights within the household. 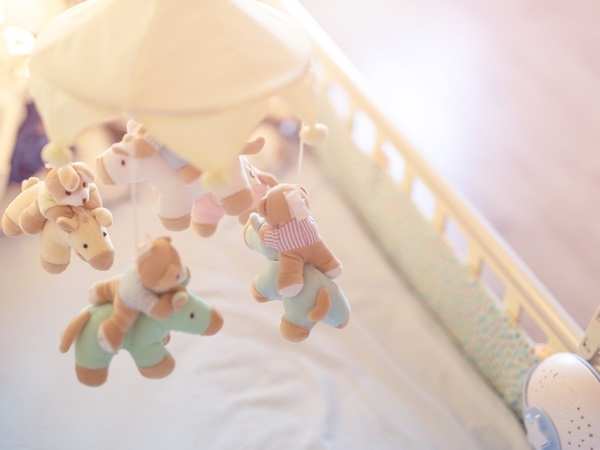 But there are some ways to help your little one rest easier and we've got the need-to-know quick facts to choosing a good soother. The one thing first-time parents are often warned about is that their new born will cause sleepless nights within the household. It’s almost taken as a given, but is there anything you can do as parents to help your little one to rest easier? It’s totally normal for your baby to fuss and cry because it's how they communicate, writes Linda Rogers, a content writer for Fischer-Price. But if your child isn’t hungry or wet or tired, you might need some other methods of soothing. While there’s no magic product that will immediately get your child to sleep soundly ever night, it’s worth investing in a good soothing toy to help your baby (and you) get a good night’s rest. At this point you might be wondering what’s a soothing toy? A soothing toy is any toy that plays white noise or music, lights up the room softly, or offers soothing comfort to help a baby wind down before bedtime. The most expensive option is not always the best one, and with soothing toys prices often vary. However, you should put in place a limit on how much you are willing to spend on the soothing toy. Quality soothing toys in South Africa range in price. What type of sound should it make? “Sounds can be soothing,” writes Dr. Bettye M. Caldwell, Professor of Paediatrics in Child Development and Education. “Experts actually think babies enjoy static sounds like a washing machine, vacuum cleaner, fan, or running water because they mimic the body noises the baby heard in the womb,” she writes. There’s no way to predict which sound your child will prefer so it’s important to get a sleep soother with a variety of sounds so that you can change from song or sound according to what suits your baby’s sleeping habit more. Many soothing toys have volume control which is good especially if the toys make sounds. You’ll want to control the volume based on what pleases your child. It should be loud enough to get your child to fall asleep but not so loud that it keeps them awake. The current trend in baby sleep soothers are ones that are also projectors. The dual effect of calming sounds and lights help your child to sleep soundly. However, Kim West, author of Good Night, Sleep Tight, writes that dimmed lights and a darker room helps your baby understand that nights are for snoozing. Should it be a device or a toy? Some sleep soothers are loose standing toys while others are incorporated into a soft toy. A good example of both is the Butterfly Dream Soother from Fisher-Price. Some babies might be comforted better by cuddling with a soft toy that makes soft sounds and glows, but a loose standing device is easier for parents. Luckily, you’re really spoilt for choice on this front. You can find a variety of soothing toys to fit your baby’s specific needs at Takealot , Toy Kingdom or Toys R Us. This post is sponsored by Fisher-Price produced by BrandStudio.24 for Parent24.